Create Essay Contests where visitors can submit their essay / content entry for your fans to vote on! Multiple options are available. Select this option to begin creating a essay contest. See to it that you're in the Manager section and then click the Add App button. Then, scroll down the page until you reach the Contest Apps. Search for the Video Contest App and click the Add+ button. You will then be forwarded to the App Builder page. This section includes numerous sub-sections specifically Contest Setup, Voting Options, Admin Entries, Live Contest, Essay Options, Layout Options, Rules, Privacy, Pre-Contest, Post-Contest, Security and Delete Entries. 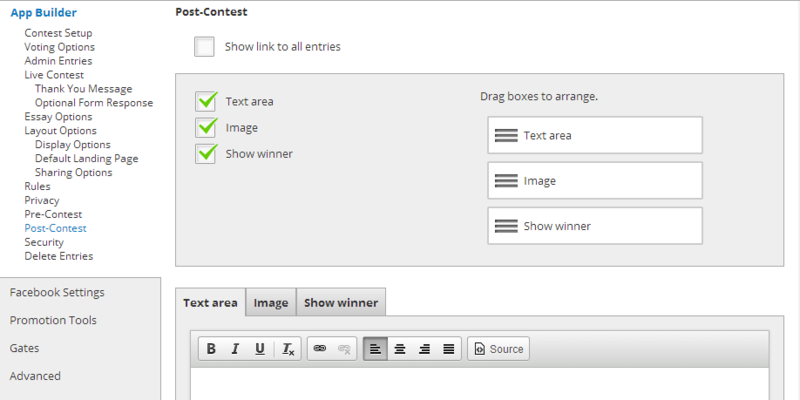 The Contest Setup is the first sub-setting of App Builder. It necessitates you to enter your preferred Contest title. This title is secretly displayed and for interior use only. You can adjust the start date and time of your contest, in addition to its end date and time. You must also keep in mind to regulate your present time zone from the drop-down menu given on the page. Furthermore, you can add email submissions to users you would like to alert concerning the contest. Conversely, the Enable email check button enables you to obtain an email of each offered entry. It is suggested to uncheck this option if you don’t want your email to be flooded by thousands of entries entering in. Note: Gold users will need to make certain they have access to winners by making the Entry Form Fields and choosing the “Admin Display” checkbox. Platinum users will have access to participant details with the use of the Exporter link on the left in the TabSite Manager at all times. Select the Entries toggle if you require to include your own entries for fans to vote on. This allows you to load entries of your choice for the contest. Next, fans can vote on your entries, and they are not able to submit any entries themselves. You will then include entries under the “Entry Form” set-up area. You can add as many of your own entries as you select. You will be able to select how you would prefer to exhibit the entries with the “Display entries by” checkbox. Choices encompass “most recent”, “votes” and “random”. The checkbox called “Entries do not go live on page until page admin approves each” is offered at the Platinum level and receives entries to be tested by the TabSite Admin before it becomes live on the fan page. The Voting Options section is the second sub-setting of the App Builder page. It enables you to designate the voting frequency of the app either “once per 24 hour period” or “once per contest/stage”. 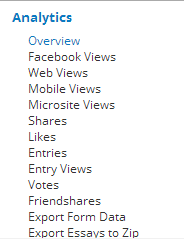 An additional option for the page lets you select how many votes per contest/stage. All you have to do is enter the amount you want. There are 2 methods to adjust your voting manual; either by writing it into the text area or through your customized image (Set its position on the page and ensure it is 800 x 310 pixels). The Admin Entries is the third sub-setting of the App Builder page. Entries for your contest are included to this form. 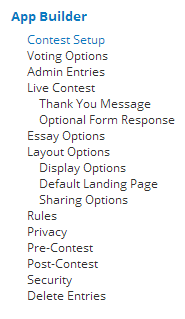 If you have chosen to “use only page admin entries”, this is where you generate entries for your contest. The Live Contest sub-setting below the App Builder page has its own sub-sections; the Thank You Message and the Optional Form Response. You are able to adjust your own Thank You Message for users who participated in the Live Contest. Simply click the check boxes of the portions you want to modify and add to your message. These are composed of the Text area, Image and Form. The Optional Form Response is the second sub-section of Live Sweepstakes. It allows you to define the behavior of what contestants view after they have submitted to the Thank You Message the optional form. The settings on this page will be inactivated and have no effect if a Response URL is utilized for the “Thank You Message”, or there is no “Thank you Message” is defined. The next sub-setting of the App Builder is the Layout Options. You can select the Aspect ratio of your Layout Options from the drop-down menu provided on the page. Choices include 1920 x 1080 (HD), 640 x 480 and 1 to 1 (square). It has three sub-sections namely Display Options, Default Landing Page and Sharing Options. The Display Options sub-section enables you to display your uploaded photo's features. It has two displaying options specifically Large View or Thumbnail which lets you to “Show title on”, “Show Vote button on”, “Show votes on” and “Show profile pic on”. The “Show profile pic on” exhibits the Facebook profile picture and name of the user and will link to their Facebook profile when they tick the checkbox. Customize the Vote Icon and Share button by changing their default text, text color as well as button color. Additionally, you can activate the Thumbs up button for your vote icon. The Default Landing Page has two options you can select; either to vote or to enter the contest. The “Vote” option enable users to see the existing entries from your contest as the first tab while the “Enter contest” let users join your contest on the first tab. Share your features to social media networks via the Sharing Options. It is advised to click the check boxes of all the social networks we provide to boost your sharing options. When it comes to Rules and Privacy, just modify these features by substituting the default texts to your own version. In terms of the Pre-Contest sub-setting, just modify the texts in the Text area. Modify the labels you would like to utilize for your Countdown. In relation to the Post-Contest sub-setting, just modify the default information in the Text area. Modify the Contest Winner text as well as the quantity of winners you want to reveal. This is helpful if you aim to feature numerous winners. They will exhibit from left to right in sequence of most votes. When it comes to the Security sub-setting, choose from the two selections you want to give focus on. These choices are Facebook account and IP address. The Facebook account selection monitors distinct Facebook accounts and just enable contest entries and votes (per your voting options) from each Facebook account. There is a mini-selection for the Facebook account to “Allow only verified Facebook accounts”. For furthersecurity, you can allow this option so that only accounts that are verified can vote (This option does not affect restriction on entering the contest). The feature averts “vote-buying” from taking place by fake Facebook profiles that have been bought to vote for an entry. This does enforce that any account has undergone the Facebook’s verification procedure which necessitates inserting a mobile number to the account, receiving a message via text, and then entering this code to confirm. In this section, you can effortlessly delete your entry form data. The Promotion Tools is the third one in the list. It has four sub-settings to be precise Social Sharing Options, Blog/Web Call-out Tool, Post Planning and Comment System. The Comment System sub-setting lets you manage your comments. Additional options will display below after checking the "Enable Comment System" box. These options comprise of "Allow visitors to sign-in to comment via", "Comment Notification Emails", the "Require Comment Approval" checkbox and the Manage Comments button. The "Allow visitors to sign-in to comment via" option enables either Facebook or Form as the process you will utilize for posting a comment. To disable the capability to post new comments, just uncheck both options to lock the commenting procedure. Then again, you are able to select whose email addresses you would like to notify anytime a new comment is published using the "Comment Notification Emails" option. The "Require Comment Approval" checkbox as well as the Manage Comments button don't need additional justifications for their intention are already specified in their texts. There is also a setting called Gates where it serves as checking tool for users visiting the fan page. First, you need to upload an 810 x 810 pixel photo to create your Like Gate image in any of the following accepted formats: jpg, gif or png. 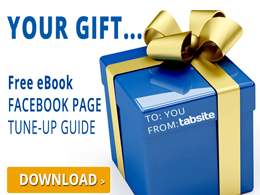 Users are required to like the fan page first before they can gain access to the Instagram tab content details. If they haven't liked the page yet, only the Like Gate image will be displayed to them. The Advanced setting is the fifth one on the list. You can upload an 810 x 75 pixels header image for your app in this section. You can choose to simply drag and drop the image to the page or upload it directly from your computer. Your link color, text color and background color can also be customized in this section. Lastly, the setting has already provided the default styles for customizing the CSS associated with your app. The Language settings encompass three sections specifically General, Comment System and Default Text. Just modify the default texts sitting on the page through replacing them with your desired input information to its sub-sections. These sub-sections comprise of Entry Form, Live Contest and Post-Contest. It also has the additional options such as “Vote Instructions”, “Pre-Contest” and “Post-Contest”. Simply upload a matching image to each of these sections (abide by the suggested image dimension) and designate its alignment. The Analytics page is the last one in the settings list. It has graphs representing the different traffic sources such as Overview, Facebook Views, Mobile Views, Microsite Views, Shares, Likes, Entries, Entry Views, Votes, Friendshares, Export Form Data and Delete Entries. This is how you'll view the amount of Shares, Likes, Entries, Entry Views, Votes, Friendshares, Export Form Data and Delete Entries of your app. If you have already finished doing all the necessary adjustments with the settings, just click the green "Save" button situated at the bottom-right part of the page.